Magic Holidays: Why Should Santa Have All The Fun! Why Should Santa Have All The Fun! …Oh what fun it is to ride, in a one horse open sleigh! Yes, you know what we are talking about! Every year, you all must be celebrating this wonderful day in a way that is unique to you. This year, how about enjoying the festivities while having a cultural adventure? And don’t worry, we’ll update Santa on your whereabouts – you can count on us for that. Let Santa follow you to a place as warm as his heart & as jolly as his nature – the evergreen Goa! 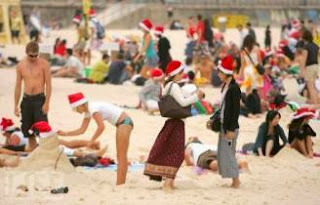 Christmas in Goa, it can’t get any better than this, can it? If you are looking forward to enjoying an authentic Catholic Christmas, just pack your bags & head to Goa & in fact South Goa to be exact. Goa as whole is a fun place to be at but honestly, the ‘party essence’ is way over hyped!It is just unfair to associate a cultural place like this one with a perpetual party tag. Come to South Goa if you want to smell real Christmas in the air (Oh wait! Sorry that’s fish curry). The enchanting churches emit mesmerizing carols around this time of the year. The masses held during this period have a contagious happy & joyful ring to them, you just can’t escape it! Take a stroll down the beaches, and don’t forget to dine in at the beach side shacks. These not only provide typical lip-smacking Goan delicacies but the variety of fish curries will leave you wishing you had more than just one tummy! With accommodations ranging wide in price & variety, one can easily find a perfect place to crash – no matter if you are with family, or are just on your own. Also, Goa is conveniently connected with trains, buses & flights. Whether you are a lone ranger or with bunch of friends or family – South Goa is a place for all. With so many festivals taking place at the same time, there is something for everyone! So folks have happy ho-ho-ho-lidays!